Title: 12/30/1997 - Manufacturer and employer responsibilities when providing MSDSs electronically. 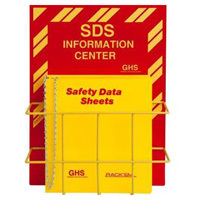 Thank you for your correspondence of October 7 requesting clarification of the Hazard Communication Standard (HCS) as it pertains to the electronic transmittal of Material Safety Data Sheets (MSDSs). Specifically, you requested that OSHA issue guidelines for an acceptable format for the electronic transmission, storage, and dissemination of MSDSs. The manufacturer must ensure that the downstream user has agreed to this type of information access. The manufacturer cannot require the downstream user to purchase new technology in order to obtain hazard information. The manufacturer must ensure that some positive and verifiable form of notification (such as a letter or e-mail) is provided with all of the information necessary to access the MSDS(s). The manufacturer must ensure that some positive and verifiable form of notification is provided to ensure that the downstream user is aware when MSDSs are updated due to significant changes in health hazard information or ways to protect against the chemical. The employer must ensure that MSDSs are readily accessible and that there are no barriers to employee access. This includes ensuring that reliable devices are readily accessible in the workplace at all times. The employer must ensure that workers are trained in the use of these devices, including specific software. The employer must ensure that there is an adequate back-up system for rapid access to hazard information in the event of an emergency including power-outages, equipment failure, on-line access delays, etc. The employer must ensure that the system of electronic access is part of the overall hazard communication program of the workplace. The employer must ensure that employees are able to obtain hard copies of the MSDSs, if needed or desired. In case of emergency, the employer must ensure that mechanisms must be immediately available to provide emergency response personnel with hard copies of MSDSs. Additionally, it has been a long-standing policy of OSHA that the transmission of hazard information over the phone is not acceptable. You also requested that OSHA re-examine our position on the liability of service companies which assist manufacturers or employers in converting MSDS information into an electronic format. These service companies are considered third-parties to the standard and are not recognized entities under the HCS. Therefore, they would not generally be cited for violations of the standard. Despite the use of third-party service providers, manufacturers maintain responsibility for the adequacy and downstream flow of hazard information and employers maintain responsibility for the adequacy of their workplace programs. OSHA is not in a position to address the contractual obligations that third-party providers have with their clients or the responsibilities and privileges under HazCom that those obligations may confer. It is my hope that this information is helpful. Thank you for the time and interest that you have taken in this matter. If further information is needed, please do not hesitate to contact us.